A boundary-scan (JTAG) based simple logic analyzer and circuit debugging software. Provides 1) the ability to monitor pin values in real-time without interference with the normal operation of a working device and 2) to interactively set up pin values for testing of board-level interconnects or on-chip internal logic. Monitor and control pins without touching a board. Easily access pin signals of BGAs and fine-pitch devices. Interactively set up pin values to check board-level interconnects for shorts and opens. Test on-chip internal logic, e.g. debug CPLD firmware. Debug prototype designs and detect PCB defects. Supports any JTAG-compliant devices (most modern CPUs, microcontrollers, FPGAs and CPLDs). Graphical visualization of packages with color-coded pin values updated in real-time. No netlists required, only BSDL files need to be provided. CPLD and FPGA pin names and buses can be imported from Xilinx ISE .ucf and Altera Quartus II .qsf files. An easy-to-use and affordable solution for manual interactive boundary-scan. No special knowledge is required to use boundary-scan technology (also known as JTAG or IEEE 1149.1 standard) as TopJTAG Probe provides a simple and intuitive user interface. Bypass, Sample, Extest and Intest boundary-scan instructions are supported. This enables the observation of pin values of a working device (Sample mode), the manipulation of pin values to test board interconnections (Extest mode) and the manipulation of pin values to test on-chip internal logic (Intest mode). 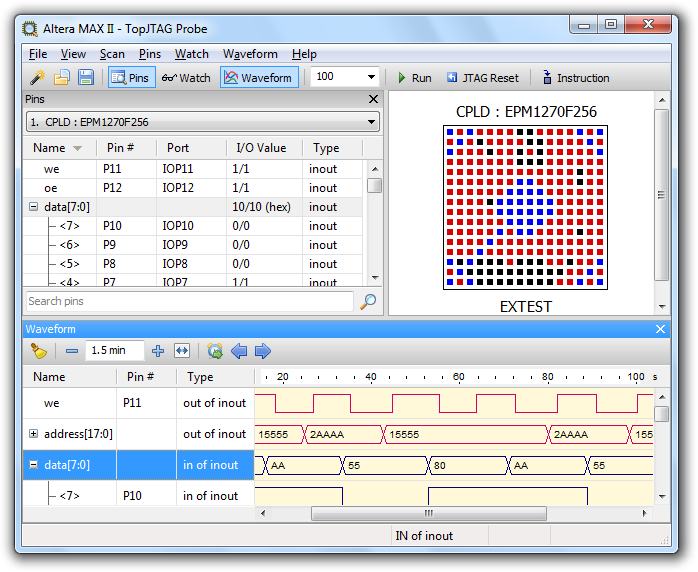 For example, Extest mode can be used to detect PCB defects, Intest mode is convenient for debugging CPLD designs. TopJTAG Probe is an effortless, affordable and powerful JTAG solution for design debug, diagnostics and repair. You are welcome to download and try TopJTAG Probe for free for a period of 20 days. Watch a quick video tour. boundary-scan? See our TopJTAG Flash Programmer.